Hello everyone, Joy's here. I'm so glad to be back on Craftin Desert Divas' blog today sharing my card for our weekly Designer Creative Challenge Theme: Floral and Fairytales. I love the Moana movie and was reminded of the characters upon seeing these digital stamps. Continue reading to see how the card came together. First, I cut a piece of watercolor cardstock using the largest die from the Torn Paper Dies. Next, I used the Beach Scene Stencil and colored the bark of the coconut tree using Tea Dye and Vintage Photo Distress Oxide Inks. For the leaves and the island, I used Mowed Lawn and Evergreen Bough Distress Oxide Inks. After that, I masked the top part of the card and the island. The sea was created by adding Cracked Pistachio and Mermaid Lagoon Distress Oxide Inks to the unmasked section. Then I used the Hill Scene 2 Stencil along with Wilted Violet Distress Oxide Ink to create the clouds. This is such a versatile stencil! 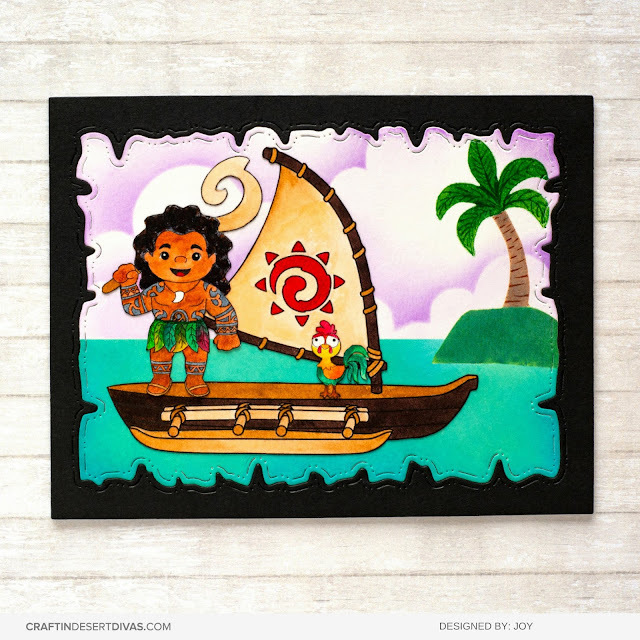 I printed the Island Hero, Ocean Adventure Boat and Chicken Pal Digital Stamps on a watercolor cardstock. Then I fussy cut and colored them using my Zig Markers. Next, I added details to the tree using gel pens. I cut a second outer frame from dark cardstock using the largest die from the Torn Paper Dies. Then I stuck it on an A2 top folding card base, followed by the background panel. The colored digi images were the finishing touches added to the card. Working with digital stamps can be fun! I hope you'll print a few on your favorite watercolor paper soon and give it a try.